Northern façade of the Bara Sona or Golden Mosque, also known as the Baradarwazi, Gaur. bl.uk > Online Gallery Home	> Online exhibitions	> Asia, Pacific and Africa Collections	> Northern façade of the Bara Sona or Golden Mosque, also known as the Baradarwazi, Gaur. 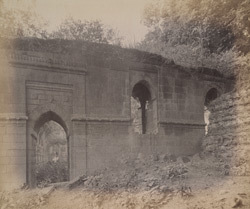 This photograph shows the northern end of the Bara Sona or Large Golden mosque in Gaur, taken in the 1870s by Joseph Beglar for the Archaeological Survey of India. The mosque was built in 1526 by Bengali Sultan Nusrat Husain Shah and is the one of the largest buildings still standing in the former sultanate capital of Gaur. It has eleven arched openings in its main facade, with a sanctuary of three aisles and an arcaded verandah facing out over the courtyard. The mosque is part of larger enclosure that originally had monumental gateways on three sides, two of which survive today. It is faced in the dark basalt stone quarried in nearby Bihar, used so often in Bengali sultanate architecture, and was originally roofed with gilded domes from which it takes its name.